The 2013 garden season will be known for many things, mostly for the flood that rolled through the greenhouses and sales area, leaving tons of silt and destruction in it’s wake. 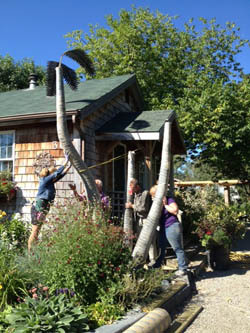 The most unusual thing about the 2013 garden season is the new garden art! Now this is the best thing we have ever installed. 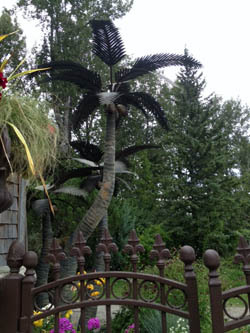 Yes full size metal palm trees. How does a gardener landscape the public space, in the garden, which is an ambiguous space in our society, privately owned, but treated as public? The traditional approach is to cover most of the area with lawn and then embellish it with a few non-functional shrubs and trees. Well that is one way to look at it for sure. On a trip with my Aunt, in Shropshire, several years ago she took me to a large private garden. My Uncle had built many structures there and it was an enjoyable afternoon. 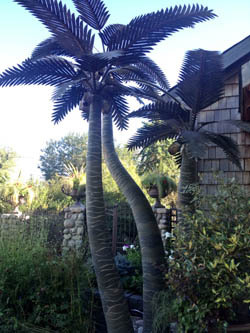 As I was leaving and heading around the house to the car, there it was a wooden Palm Tree. And that was it, I wanted one!! So upon my return I created a garden space and left an area whereone would be installed. Instead I created a Grove. But where do you get such a thing? Kansas of course. This small garden area is placed right in the most public space in this garden. 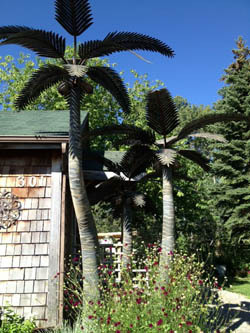 However the art its self blends so nicely into the garden most of our customers never notice it. Did you see them?